October seems to have slipped by me. 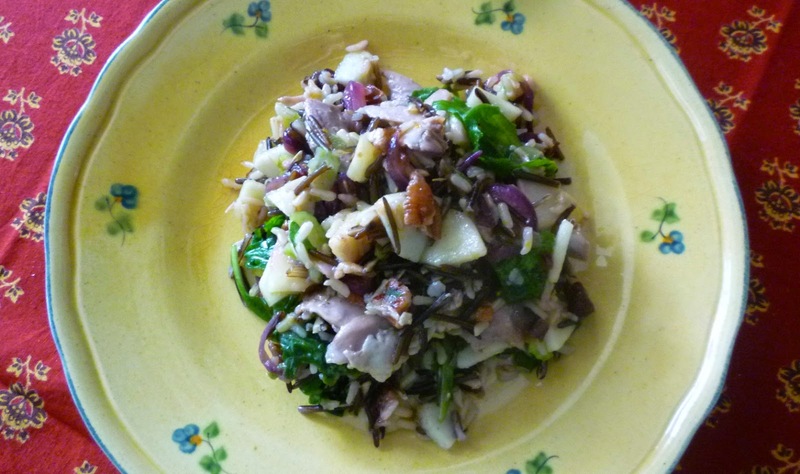 It had been my intention all month long to share the recipe for this wild rice salad…and now the month is gone. It is a salad that is appropriate for the warmer days of autumn, but I also think it would be a delicious addition to a holiday buffet….or potluck gathering…not to mention the fact that it would make a delicious boxed lunch just about any time during apple season. So, before November gets away from me, I thought I would start the month off right by posting it now…on the first day of the month. I love grain salads (and pilafs) so when I started working on a new apple class for this year I wanted to include a grain salad. A wild rice salad seemed like a good idea. 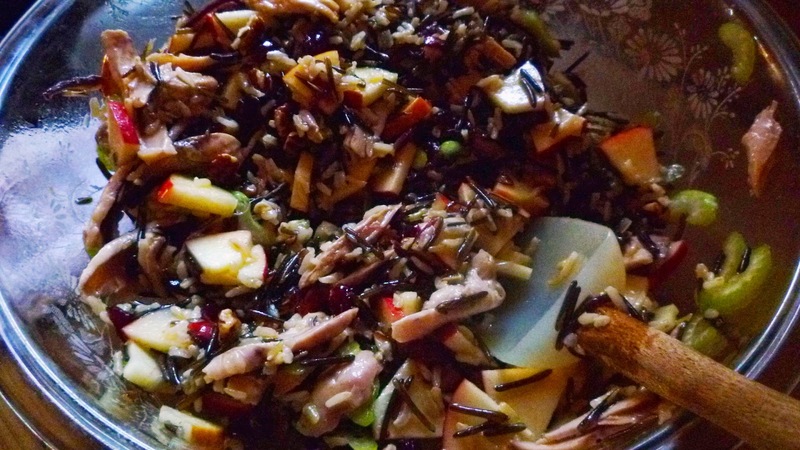 Wild rice and apples are linked in my mind because I associate them both with fall in Minnesota. When I was a kid we moved to Minnesota for a couple of years. We arrived in the fall and it would have been about that time that I first tasted wild rice, which is of course native to Minnesota. But apples grow just about everywhere, so you might wonder why I associate apples with Minnesota. I would say it is most likely because it was there that I was first exposed to apples in all their regional diversity. Even my kid’s limited and picky palate was able to delight in the unique flavors and textures of Cortland, Haralson and Prairie Spy apples. Since none of these varieties are available in the lower Midwest where I have spent most of my life they were quite exotic to me and gave me a whole new appreciation for apples. When I returned to Minnesota for college I was so pleased to discover that every fall a nearby orchard trucked in a load of these wonderful regional varieties on Friday afternoons to sell outside the campus center. 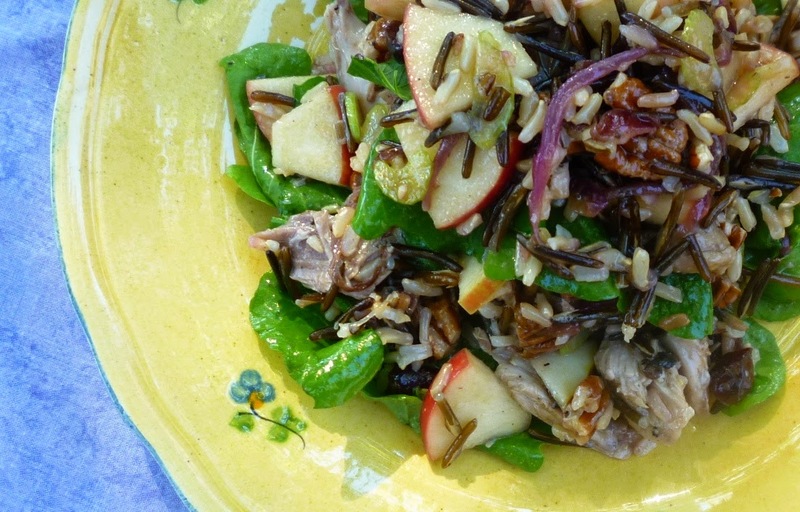 Wild rice is the featured grain in this salad, but since munching through a salad of all wild rice would be a bit of an exercise, I have cut the wild rice with some brown Basmati. (You can use any long grain brown rice you please, but I particularly like fragrant Basmati.) 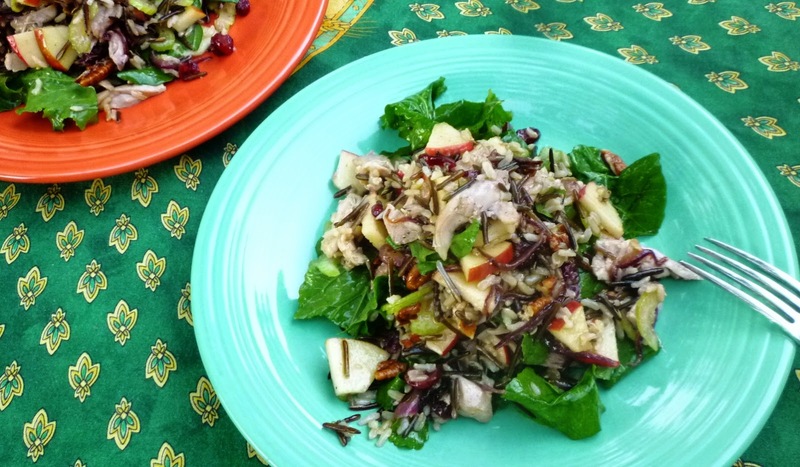 The advantage of pairing the wild rice with a long grain brown rice is that the brown rice will cook in the same amount of time that it takes the wild rice to soften. This makes it possible to cook them together in the same pot. Since there are a lot of elements in this salad, this is a great advantage. Cooking them together will also force you to remove the rice from the heat when the brown rice is done...thus preventing the wild rice from getting so soft that it splits open and curls. Wild rice taken to this point has been cooked too long. I recently read on the bulk bin at Whole Foods an excellent description of what wild rice should look like when it is perfectly done: It should have begun to split down the length of the grain and will look something like a hot dog bun…it should not look blown open like a popcorn kernel. At the correct doneness, it will still have texture, but it will also be tender. When you choose an apple for this salad, make sure that you choose something crisp with a sweet—or possibly sweet-tart—flavor profile. Softer apples will fade in competition with the other lively textural elements (in addition to the crunchy-chewy wild rice, there are crunchy pieces of celery and pecans as well as chewy dried cranberries). Apples that are too tart will fall flat…the salad needs sweetness to lift the flavors. Hints of sweetness come from a bit of honey in the dressing and from the orange juice soaked dried cranberries, but these are not quite enough. Something like a juicy Honey Crisp or Pink Lady…or a super-crisp Gala….will add a vibrant splash of flavor. If you have a local apple that you love that is crisp and sweet, you should definitely give it a try in this salad. Rinse both kinds of rice and drain well. Place in a medium saucepan and cover with five cups of cold water. Add 3 or 4 good pinches of kosher salt (about 3/4 t.) and bring to a simmer. Simmer gently—uncovered—until the rice is tender, but still has texture...about 40 to 45 minutes. Don't allow the wild rice to blow open like popcorn (when done, wild rice has a vertical split, giving it the look of a split hot dog bun). Drain the rice and spread on a sheet pan to cool. While the rice cooks, rub the chicken with olive oil and season well with salt & pepper. Place in a casserole or roasting pan that is just large enough to hold the pieces without touching. Roast in a 450° oven until the juices run clear and the skin is crispy—about 40 minutes. Transfer to a plate to cool. Pour the fat off from the pan and discard. Deglaze the pan with a splash of water. When the chicken is cool enough to handle, remove and discard the skin. Pull the meat from the bones, tearing it into large bite-sized pieces. Toss the shredded chicken with the pan deglazings and any resting juices. Taste and season with salt & pepper. Set aside. While the chicken and rice cook, warm a sauté pan over medium to medium-high heat. Add a tablespoon of oil to the pan, followed by the onions along with a pinch of salt. Sauté the onions until tender & golden...about 10 to 15 minutes. Set aside to cool. Place the dried cranberries in a small bowl and toss with the orange juice. Let sit for 10 to 15 minutes. 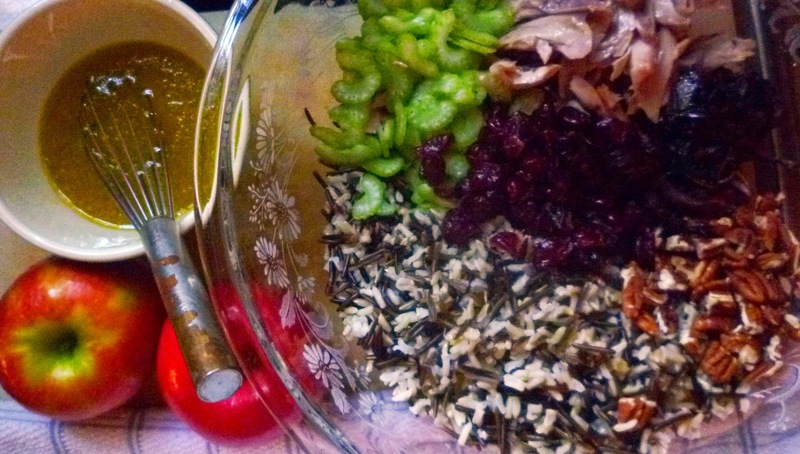 While the cranberries soak, make the vinaigrette. Place the zest, cider vinegar and honey in a small bowl. Season with salt and pepper. Whisk in a quarter cup of olive oil. When ready to pull the salad together, quarter and core the apples (peel them only if the skin is tough). Cut the quarters in half lengthwise. Cut these eighths crosswise a scant quarter inch thick. Place the apples, rice, chicken (with its juices), onions, craisins (with any unabsorbed orange juice), pecans and celery in a large bowl. Season with salt and pepper and pour the vinaigrette over. Toss well. Taste and correct the seasoning with salt, vinegar and honey. Add the arugula and toss in just before serving. Serves four generously as a salad entrée. After roasting and shredding the chicken legs, you will have 7 or 8 oz. (200 to 225 grams) cooked meat. If you have leftover (or rotisserie) chicken, you can use it in this salad. Simply weigh out this amount and add it to the salad instead of cooking fresh. I only add arugula to what I will be serving immediately…and then add fresh arugula to leftovers as I eat them. It is fine to add it all at once, but the arugula in the leftovers will have softened and lost its crispness. If you don’t like arugula, baby spinach would be a good alternative. If you don’t have an orange on hand, you may substitute apple cider (or juice) for the orange juice (use about 3 T.) and simply omit the zest from the vinaigrette. This salad would be delicious with shredded duck confit or roast, shredded pheasant in place of the roast chicken.